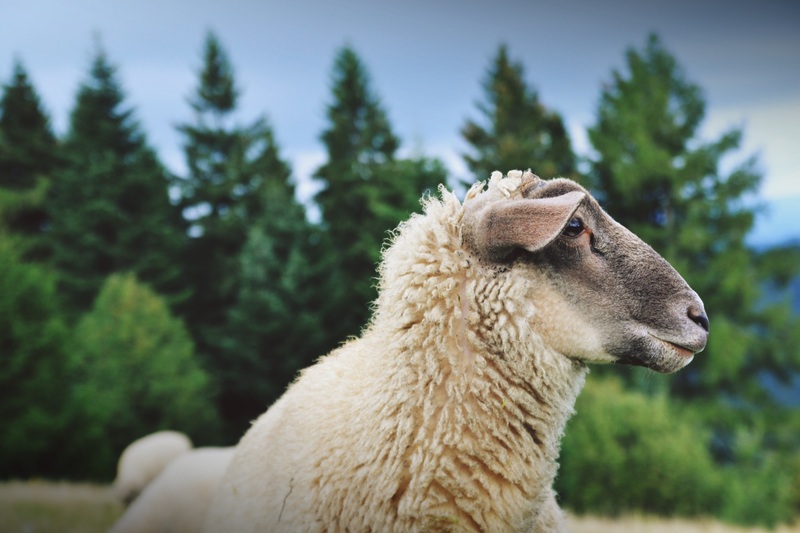 A firm recovery in price across all east coast categories of lamb and mutton reflecting the underlying tight supply anticipated this season to see the Eastern States Trade Lamb Indicator (ESTLI) surge to fresh highs, closing at 664¢/kg cwt yesterday – a gain on the week of 7.4%. The stellar performance of the ESTLI so far this year reflected in the seasonality percentage price gain chart displayed in figure 1, showing the gains since the start of the season extending beyond the “normal” range (as represented by the green band showing where seasonal price gains have fluctuated 70% of the time over the last decade). Strong weekly gains not limited to trade lambs with the east coast heavy lamb up 7.3% to 671¢, Merino lamb up 5.6% to 596¢ and restocker lamb up 13.4% to 754¢/kg cwt. East coast mutton also enjoying some upward momentum on the week, reflective of the trade and heavy lamb gains, to see it rise 7.5% to 441¢/kg cwt. Figure 2 showing the seasonal percentage gains for mutton so far this year respectably tracking along the ten-year average pattern. 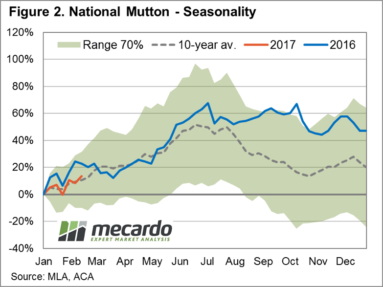 Although the price pattern for mutton not as robust when compared to the ESTLI performance and the pattern set by mutton during the 2016 season. 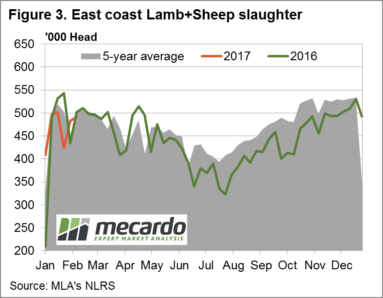 Figure 3 highlighting the underlying tighter supplies of lamb and sheep this season with the combined east coast lamb and mutton slaughter levels continuing to trend below the 2016 pattern and under the five-year average for this time of the year. To read more about the expected tight supply during 2017 and our ESTLI forecast released in December 2016 click here. 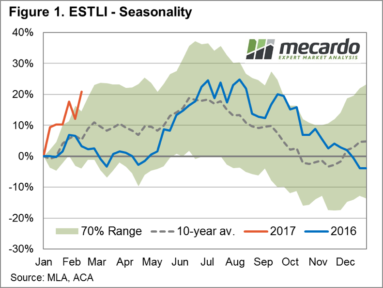 Autumn generally heralds a period of price consolidation for the ESTLI as shown by the sideways movement of the ten-year average seasonal percentage price gain pattern – figure 1. This would suggest that the ESTLI will find it difficult to continue to post the impressive gains recorded since the start of the season and will likely trend along the top of the green band until the next price surge as we head into the usual winter peak. Interestingly, projecting a percentage price gain mirroring the top of the green band during winter 2017 of around 35% on the starting price this season of 549¢ would place the winter peak for the ESTLI at around 740¢ – not far off our ESTLI forecast released in mid-December 2016 calling for a winter peak of 750-755¢ (see link above).